Today was one of my best running days so far. I have been fighting the pain of shinsplints since I began running with my new shoes five weeks ago. My Under Armor gym shoes are very comfortable but being an aspiring trail runner for long distances, I knew I needed a sturdier shoe. I did the research online, I asked friends with they were using, and tried out some from the San Francisco Running Company in Mill Valley. The Hoka One One that Victor had recommended were far too narrow for my duck foot. They were his favorite and I did my best to like them, but sitting at my desk at home just seeing how they would work, my feet felt like they were in a vice. So back to the store the next day to swap them for my current shoe, the Altra Olympus. The shoe is great for my foot, it has a wide toebox with ample room for my foot swelling and running downhill. Since this running thing is altogether new for me anyway because I’m coming from a cycling background, the mysterious origins of new pains are something I had expected in my new sport. I tried as best I could to run through the pain that running was giving me. The Altras are a “Zero-Drop” shoe, meaning that your foot is anatomically correct, and flat, without your toes dropping down an angle below your heel. This is supposed to help in long distance running, but a very foreign concept for my poor feet. Most shoes we wear have several degrees of drop to the toes. Yesterday, I put it to a test, running for 4 miles with my new Altras then switching back to my Under Armor gym shoes for one more mile. The shin splints were gone. No pain in my calf or my anterior tibialis. I grabbed some silicon heel cups from the sports store and tried them out today. Felt great! My feet and legs were just not ready for the zero drop yet. 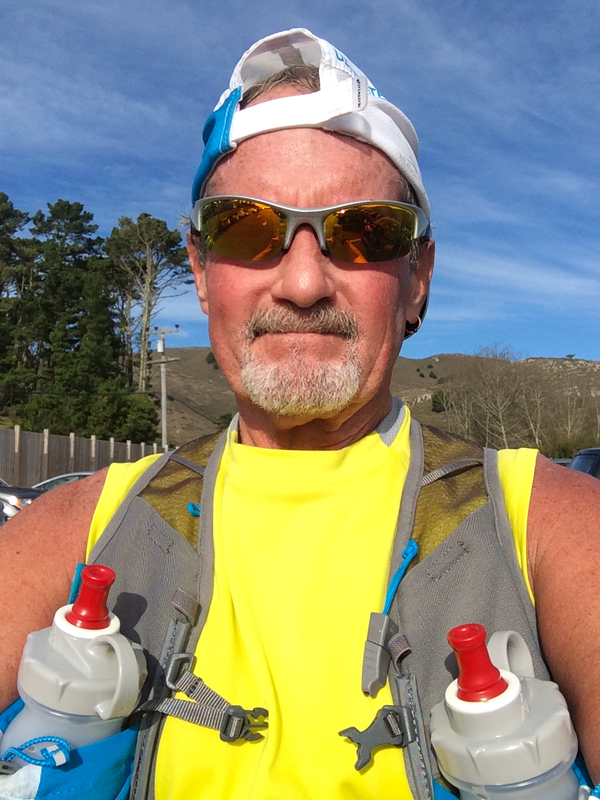 I had a great day running and felt like I could have done more, but I’m only 6 weeks into this, and at my age, I need to take a new sport slowly, not head on…RIGHT! Like that’s going to happen, ask anybody that knows me. So now that I have identified one aspect of my running game, it doesn’t mean that I’m cured now and am a certified trail runner. I worked up a chart, listing the things that my shin pain could have been from. Several of the items on the list still need attention. Since I’m a “noob” in this, who knows if I have a correct gait for distance running – I need someone with more experience to assess that sometime. What is my form starting out, then what is my form 10 to 15 miles down the road when I begin to fatigue? All in due time, I suppose, but nonetheless, today was a good day and I think I’ll just leave it at that! I started out at Muir Beach today…nice views, parking free, bathrooms…all good. Started up the Dias Ridge Trail, the one I came down a week or so ago. Great trail, well travelled and maintained. Couple people to socialize with, hence my poor splits on time, besides, it’s all uphill. (Can’t imagine what good times I could do if I didn’t stop to socialize) First thought I would pick up Miwok Trail and come right back down, but I was feeling so good, I decided to head over to the Dipsea Trail at Panoramic Highway and top off my water at Muir Woods. Great idea, met more people to socialize with and slow me down…but I wasn’t in a race so what the heck, eh? The Redwood Trail followed the road a short ways until it crosses the road and becomes trail for another 2.6 miles back to Muir Beach. Mostly flat and a couple of muddy spots from the recent rains…but that’s what trail running is all about! Finally back to Muir Beach and my car, not winded at all and felt good about myself that it was somewhat effortless today. I made it through the day without pain to stop me in my tracks and did over 8 miles.